This book has been written by a member of the Birmingham SF Group (BSFG) and what an first novel! I found this book very easy to read, and very hard to put down! It is well written and engaging. The strong female lead is very believable. I felt this was just as much a "coming of age" story as anything else, so I guess that why it is pitched at the teen/young adult category. Well, the characters ages also play a large part in that. 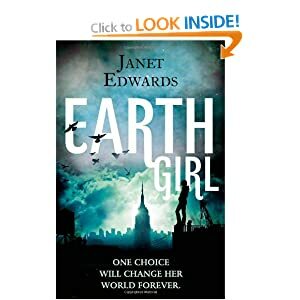 The story itself has elements which have been used before, but Janet has managed to give them a very fresh new twist. Janet's writing style is fresh and engaging, just like her main character, which makes for a solid combination. In this future portals have been developed and there has been a huge exodus of the Earth's population to new frontiers. Set some distance in the future the human race is divided into two types. Those that can portal between planets, and those that can't, "apes". Apes are one in a thousand and can only live on Earth. Due to the mass exodus Earth was left pretty much desolate and in ruins. The people now remaining are pretty much all apes and pretty much all historians trying to recover Earths lost history. There is an enmity between the "norms" and the apes, and Jarra is an ape with a chip on her shoulder. On her eighteenth birthday Jarra joins the historians from Asgard and is determined to change things. I most heartily recommend this book.